SSC Result Full Marksheet 2018 is available here for Download. SSC Result Published with two different Marksheet. At a time, all examine, guardian, Teacher and other people can download any one from Education Board Bangladesh Official Website. Education Board now publishes public results on Education Board Bangladesh official Website and also on eboardresults.com. Both servers will publish the Result on the selected time by Education Board. Before that, A press announcement cleared the result to publish time. The ministry of Education Mr. Nurul Hasan Nahid always announces the date to media. So, you will get your SSC Result Full Marksheet 2018 right time of Result. Currently, the SSC Examine receives their Marksheet with Full Marks. The Marksheet include their Theory Marks, MCQ Marks and Practical Marks on a single Subject. It carries complete concept about the Result of an Examine. So, imagine you got 46 in Bangla Theory and 32 in MCQ. Your total marks will 78. That’s in Grade “A” (GP 4.00); but you except that, you will get more marks in Theory. So, you can Apply Result Re-scrutiny for this Subject. It’s too easy. According to complete this step, you must require downloading your Full Marksheet from Online. Now you can read the step by step guideline about the SSC Result Full Marksheet 2018 Download system. We hope you will get it easily. 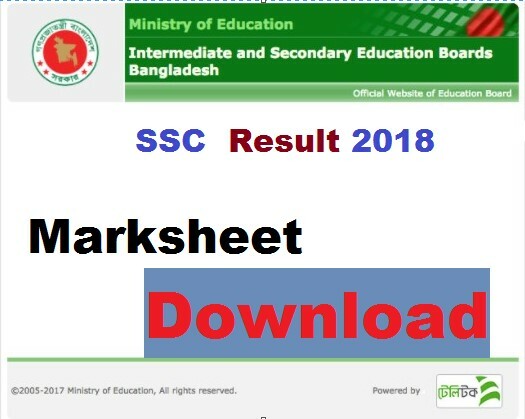 How to Download SSC Result Full Marksheet 2018? Most of the people want to download their Full SSC Marksheet 2018. Every people already kept themselves ready to do it. We are also ready. Here we have added some systems to complete the task. You need to follow these steps carefully. After that, you will get your detail Marksheet of SSC Result 2018. First, visit eboardresults.com from any internet browser. Then click on the SSC/HSC/JSC/Equivalent Result button. It’s available in the Top position. Then, you will show the Result Check Script. Then, select your Examination Category. Here your Exam Category is SSC/Dakhil/Equivalent. If you don’t show this, please click SSC/Dakhil. Then, Select 2018. It’s your SSC Exam Year. Now select your Education Board Name. If Your Education Board Name is Dhaka, You need to select Dhaka. If other, just select other. Select Result type as Individual. After selecting it, you will show two more option. Type the Security key in the Right box. The Security key is available on left side of the Security box. Just see the letter/numeric carefully and enter it into the box. Finally, click on the submit button and get your SSC Result Full Marksheet 2018. If you want, you can print the Full Marksheet easily. Just click on the Print button on the screen. If you want to know more or think something missing on this post, let’s inform us. We will try to provide you a clear response very soon. Thank you for reading our blog. when SSC Result 2018 will be published? SSC Result 2018 Bangladesh will publish within 28 - 30 April 2018. Is this right News?